Did you know the spine and nerves are infamous for referring pain elsewhere? If a portion of your lower back is irritated, you could possibly feel pain in your back, but you may also feel it in your thigh or knee. It would seem that if you feel pain in your knee, it must be coming from inside the knee. This is not always the case. 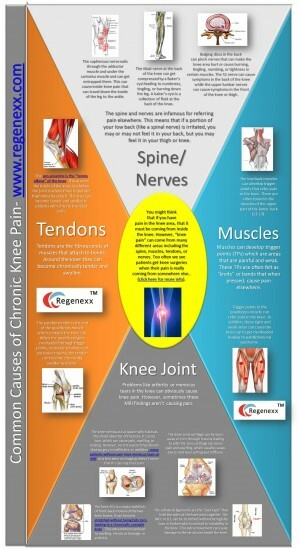 Knee pain can come from many different areas, including the spine, muscles, tendons, and nerves. Common causes of chronic knee pain can vary from bulging discs in your back and irritated quadricep muscles, to knee arthritis and tendon tears, in addition to many other causes. Refer to this cool info-graphic from Regenexx for more information. The Regenexx Procedures are a family of non-surgical adult stem cell and blood platelet treatments for common injuries and degenerative joint conditions, such as osteoarthritis and avascular necrosis. These stem cell procedures utilize a patient’s own cells to help heal damaged tissues, tendons, ligaments, cartilage, spinal disc, or bone. If you find yourself wearing a knee brace or having to use crutches due to a knee injury, CastCoverZ! has you covered! CastCoverZ! has the world’s largest selection in cast covers and patient requested orthopedic gear. We give casts, braces, splints, boots, and our designer colored crutches fashion, function and FUN! Arthritis has been one of the very common reasons for chronic knee pain. It is developed due to injuries thereby affecting the tendons, ligaments and these problems in return results in knee locking, dislocated kneecap. RICE is one of the best ideas for treatment of knee pain. Thankz for your input, Dorethea!